Literally, "the soul of." A part of the liturgy which on Sabbaths and festivals leads up to the short benediction ("yishtabbaḥ") after the Psalms and other Biblical poetry of the early morning service. Nishmat, together with this benediction, is called in the mishnaic account (Pes. x. 7) of the Passover night service the "Benediction of Song." Nishmat varies somewhat in the German and the Sephardic liturgy; in the former it is made up of 340 Hrew words. It contains near the beginning the avowal "Beside Thee we have no King, Redeemer,Savior," etc.—seemingly a protest against Christianity, and thus a later interpolation. Further on occurs the passage "If our mouth was full of song like the sea"; and the Talmud (Ber. 59b) speaks of such words as opening the form of thanks for a copious rain at its proper season, and teaches that one must thank God for each drop of rain. 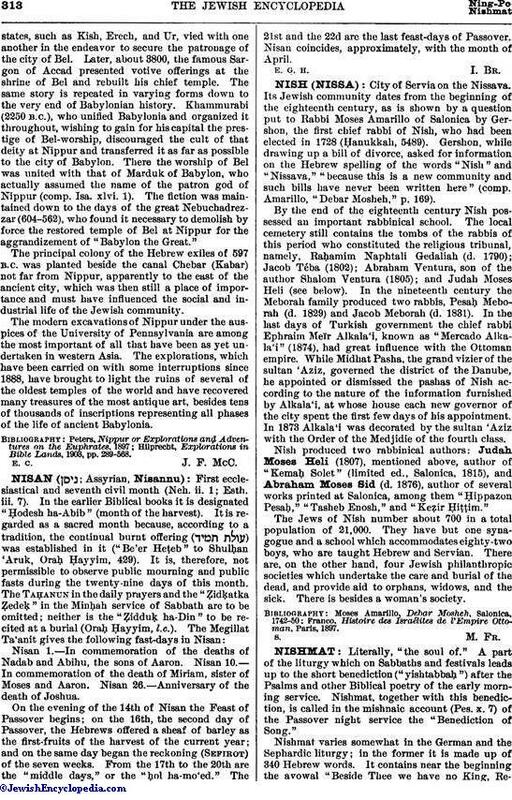 Hence the writer of Nishmat says that even with superhuman powers (e.g., "our eyes shining like sun and moon") "we could not thank God for the one-thousandth part of the thousand millions and ten thousands of myriads of benefits He has wrought for us and for our fathers," each drop being a separate benefit. It thus appears that Nishmat grew out of the thanksgiving for timely rain. Such a service, as well as the prayers at fasts in times of drought, was in use for hundreds of years before the fall of the Temple. While this thanksgiving is thus the oldest part of Nishmat, the part which follows it and gradually leads to the actual benediction over the recited Psalms differs greatly in the two rituals, and is undoubtedly of later growth. 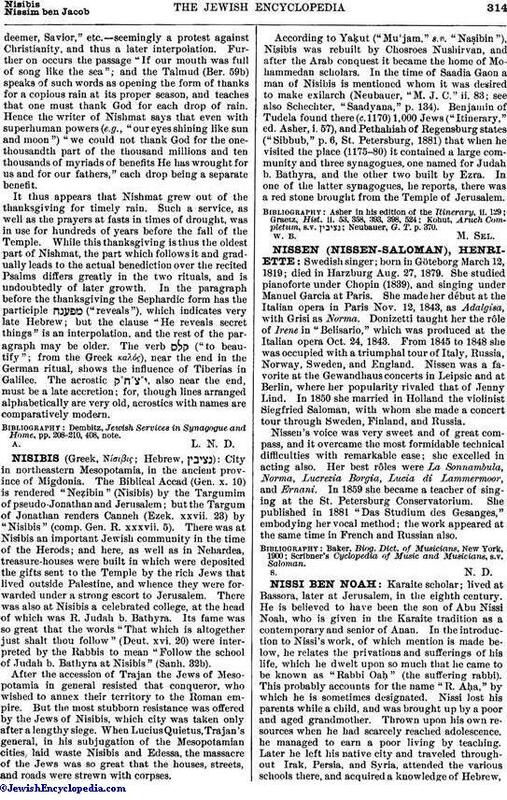 In the paragraph before the thanksgiving the Sephardic form has the participle ("reveals"), which indicates very late Hebrew; but the clause "He reveals secret things" is an interpolation, and the rest of the paragraph may be older. The verb ("to beautify"; from the Greek καλός), near the end in the German ritual, shows the influence of Tiberias in Galilee. The acrostic , also near the end, must be a late accretion; for, though lines arranged alphabetically are very old, acrostics with names are comparatively modern. Dembitz, Jewish Services in Synagogue and Home, pp. 208-210, 408, note.